Basement Clean Out In Philadelphia, Pa.
Philly Junk completes basement cleanout in Philadelphia, Pa. during snow storm. hat is the process for a basement cleanout in Philadelphia, Pa.? It’s as simple as it can be. Just pick up the phone and call PhillyJunk® @ 888-810-5865. 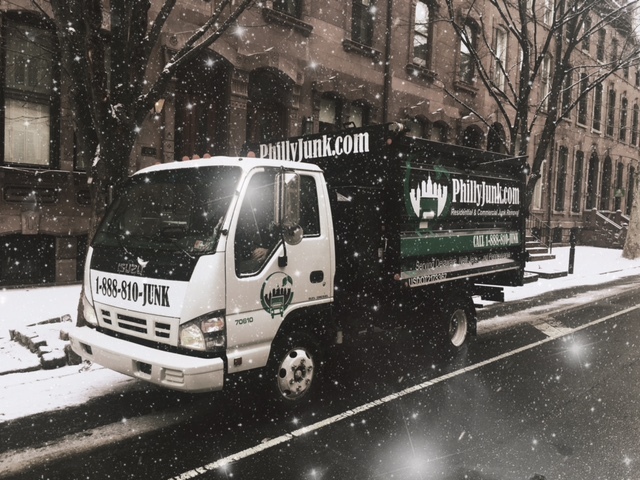 Philly Junk is a locally family owned Philadelphia junk removal service. Just let us know the day and time you want our truck and we will be there with two strong guys. We have been operating since 2010 and have completed hundreds and hundreds of complete basement cleanouts, house cleanouts, estate cleanouts, garage cleanouts apartment cleanouts, office cleanouts, storage unit cleanout and just about any other type of cleanout. One or more of our trucks will arrive. The first thing we will do is view what needs to be removed and provide you with an estimate of charges. The estimate is based upon how much material we remove and load into our trucks. So, a few things removed and loaded will cost less than a lot of things. Once we get the go ahead to proceed we will bag up whatever we need to and remove and load our truck. You could fill an 1/8 of a truck or a full truck with items which you want us to remove. Once our truck is fully loaded and there are more things to remove we simply start the process over again. Often times while we are at a house and cleaning out a basement we end up doing a garage cleanout or a partial house cleanout. If you want Philadelphia got junk we have the right Philadelphia junk removal service…. just call Philly Junk. For additional details on our rates, how we work, items charged separately i.e. piano removal, a list of items we cannot remove just visit our web site @ phillyjunk.com. If your looking for a basement cleanout in Philadelphia, Pa. just call PhillyJunk.com. It’s as easy as that. Often times we can offer same day service. We operate six days a week….on Sunday’s we are watching the Philadelphia Eagles play! We are not a franchise with headquarters in another city or country.